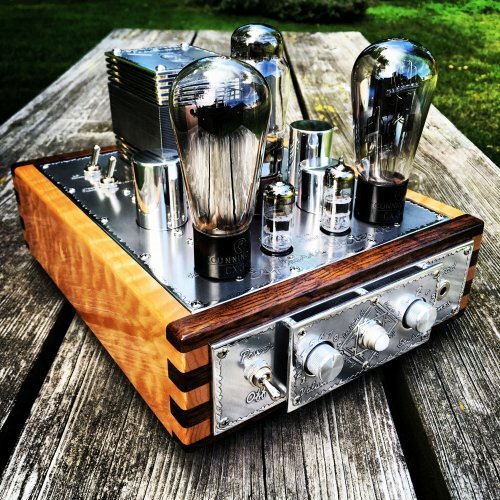 A direct heated triode amplifier hand built in Greenfield, Wisconsin. Powerful, warm, detailed, big soundstage, without breaking the bank. Disclaimer: I am very new to this hobby, this is my very first review, and my impressions are to be taken with a grain of salt as I have limited experience with headphones, DACs, and Amplifiers. I am still learning how to accurately describe what I hear and convey it to others accurately. The Gizmo action figure is mine, does not come with the amplifier and was added by me to the pictures. It was my first Canjam, I planned on taking my time, visiting each booth, and enjoying everything this experience had to offer. 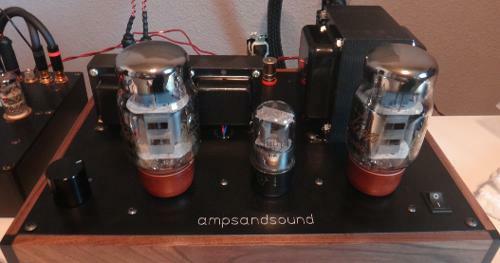 Most importantly, however, I was determined to come away with a new amplifier for my beloved Audeze LCD-4s (200 ohm). I went from Audeze to Cavalli, Chord to Questyle, Schiitt to Cayin ... I was left wanting. Finally, I arrived at the Ampsandsound table, the beefy Mogwai stared at me as if to say, "I won't disappoint you". Justin Weber, owner of Ampsandsound, arrived and we exchanged pleasantries. I unpacked my LCD-4s, connected my source material and turned up the volume. Wow. I was at my desired listening volume, but I was compelled to turn it up until the sound became distorted. The volume soon became unbearable, yet the sound was still clear and undistorted. Wow. My search was over, Justin was kind enough to offer a show discount, I called dibs on the Mogwai, we shook hands and I departed for the day, but regularly returned throughout the weekend to have extended listening sessions with my new amp. The Mogwai is sturdy and built like a tank. 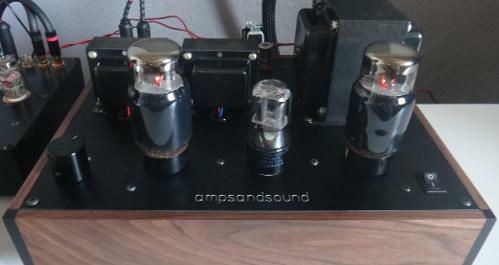 The unique design has all the inputs on the top plate, towards the back of the amp, including the power adapter, speaker connections, RCA inputs, and the 1/4" single ended input. Towards the front, the input bulb (6SL7) is flanked on the right and left by the output bulbs (KT 88s). Towards the front left is an volume knob. The Mogwai replaced my former DAC/AMP combo Burson Conductor Virtuoso 2. My set up for this review: Macbook Pro, Chord Dave, Mogwai, LCD-4, Utopia (borrowed from a friend), Nordost Blue Heaven Power cables, Nordorst Blue Heaven RCA phono interconnects, and Nordost Blue Heaven A/B USB. The Mogwai's sound is lush and warm, providing a large soundstage and excellent bass extension. The highs are rolled off a bit, eliminating some of the harsh peaks some headphones possess. For this review, I used both the Utopia and LCD-4 through the Chord Dave's built in amplifier, and then through Mogwai (Chord Dave in DAC Mode). The Chord Dave drives the Utopias well, and provides a large soundstage, excellent instrument placement, and detail. However, driven directly from the Chord Dave's amp, the Utopia is too bright for my taste, and the fatigue makes longer listening sessions difficult. I winced as Adele hit her high notes in "All I Ask" and as the crowd applauded at the end of Diana Krall's "A Case of You". Metallica's "Enter Sandman" was only enjoyable only at lower volumes. Powered by the warm Mogwai, however, those harsh highs were wonderfully masked. The bass had more authority and extension. The soundstage was widened. With those harsh highs neutralized, and the volume turned up, the music was not only heard, but felt. I could hear Diana Krall's lips separate and inhale before her intoxicating voice filled my ears. The drums in the beginning of Disturbed's "Down with the Sickness" were heard and felt like never before. A friend who heard the combination of the Utopia paired with the Mogwai and reported in our discord channel that he just had his "Mind Blown". The LCD-4s powered through the Chord Dave's amplifier left a lot to be desired. It lacked the power to effectively drive the LCD-4 to its potential. All the magic of the Chord Dave was on display, albeit at a distance, as I was unable to turn up the volume of the amplifier to an enjoyable level before it began to distort. It's as if you are on a phone call in a noisy area, and you cover your other ear in an attempt to concentrate on the voice of the person you are talking to. 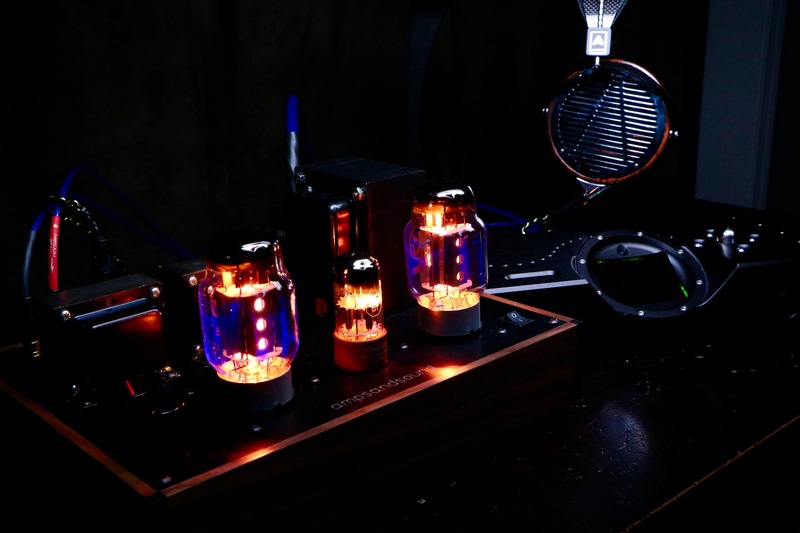 Through the Mogwai, the magical bass of the LCD-4 was heard and felt with authority. Instrument placement and separation was wonderfully accurate, and the soundstage was again widened. The drums and cymbals in "Enter Sandman" were authoritative and I could almost feel the power of the swing as the drummer struck his instrument. With the Mogwai, the LCD-4 could be listened to crystal clearly at higher volumes, making it feel as if Adele and Diana Krall were not only singing to me, but for me. Eric Clapton's "Layla" had me at the table just off the stage, each instrument wonderfully separated from the other and perfectly placed. The Mogwai enhanced the already beastly bass of the LCD-4 and brought to life the excellent detail retrieval of the Chord Dave's DAC. Overall, I would describe the sound of the Mogwai as warm, detailed, and laid back. It is not fast and dynamic. When I listen through the Mogwai, I feel the music, the emotion, the excitement and I can do so for extended listening sessions without harshness or fatiguing. It pairs wonderfully with bright headphones and enhances all the best features of warm or darker headphones. It has an excellent midrange, putting the vocals up front and in your face. The sound stage is large and instruments are well separated and accurately placed. The bass is tight, palpable, and not overly extended. Other impressions I have read make a point to say the Mogwai responds well to tube rolling, although I myself have done very little tube rolling, so I am unable to offer suggestions and pairings. Justin from Ampsandsound was awesome throughout the whole process, from demoing to shipping the Mogwai. After it arrived he was always available to answer my questions and was eager to hear my impressions. I have one minor gripe with the Mogwai, and that is the headphone input is in the back, making it tedious to connect and disconnect if it sits inside a cabinet or inside shelving. I relayed that to Justin and he said he is looking into rectifying that with future models. The Mogwai is made in the USA and retails for $1850. The following specs were taken from the Ampsandsound.com website. Input impedance is 10K ohm with alps pot, .5v for full power. Input Sensativity 800mV peek for full power out. audionewbi, jjacq, grizzlybeast and 1 other person like this. Nice review! From the sound of it (pun intended) it seems similar to the Bottlehead S.E.X. Laidback, good soundstage, tight bass etc. Also looks a bit alike. Would love to hear them side by side one day but I think it would be heard to audition the Mogwai on the other side of the ocean. I read that there is one 32ohms tap for headphones. About the Utopia, how do the Output Transformers manage the varying impedance load from 300ohms at 50Hz and 80 ohms until 8KHz ?? Cons - Only that I'd want another input. Ampsandsound are an amplifier and loudspeaker builder out of Southern California. 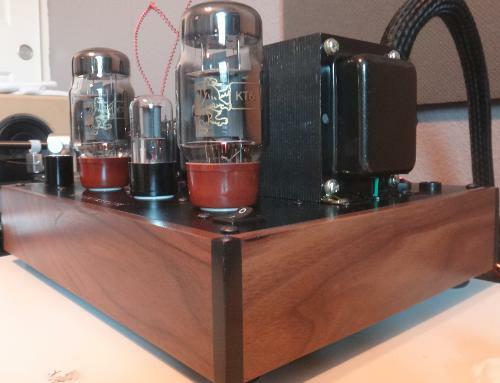 I discovered Justin Weber and team through Head-Fi, when reports of their Kenzie headphone amps appeared. Since then, I've kept an eye out, and even considered their 2 channel amps for my system. The Bigger Ben was interesting, for sure...until I caught word of the Mogwai. The Mogwai (US$1850) is a single-ended class A tube amp, that employs 2 (one per channel) EL34, 6L6GC tube, or one the many variants available (KT66, KT77, 6CA7, KT88, 6550). The input is handled by a single 6SL7. This point had me jazzed - I've plenty of these power tubes around from previous amps, and was actually daydreaming about how great it'd be to have an affordable low watt, single-ended amp I could work with. After a couple calls and some deliberation I committed. I was able to grab it when they were offering the show discount. Justin Weber was quick to respond to all inquiries, and happy to discuss his products. In addition, he delivered the amp before his original target date. The excellent service is much appreciated and deserves mention. Note: Justin does recommend that you do not run both speaker wire and headphones simultaneously. This is due to the fact that there is no voltage divider network, and both outputs are wired directly to the transformer. You will get the best performance this way. I assume for most, this isn't an issue as the Mogwai will play the role of headphone amp most of the time. The speaker binding posts, headphone jack are high quality - everything you might touch feels solidly built. With the Audioquest Nighthawks, there is no noise apparent when the volume is set at my usual level (roughly 9 o'clock), and no music is playing. The Mogwai runs quiet. Of course, as I turn the dial up toward 12 o'clock the noise becomes apparent - sensitive 'phones. For all listening, I used a Sylvania 6SL7 V-229 on input duty. My source is the Clearaudio Concept MM 'table and the phono pre is the Parks Audio Budgie. 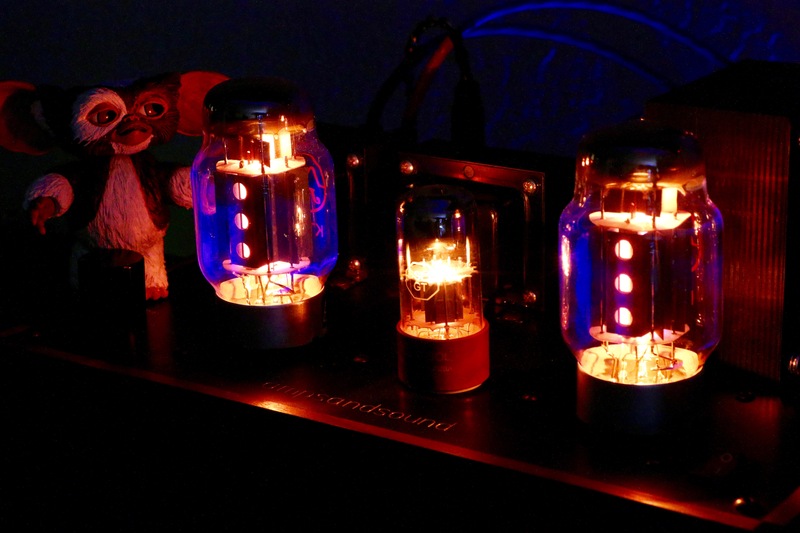 I had three sets of power tubes I wanted to try out. With the KT66 installed, the sound was spacious. I heard a larger stage with remarkable depth and layering. Overall, a I heard a balanced sound across the spectrum, though they are lacking in bass weight and presence. 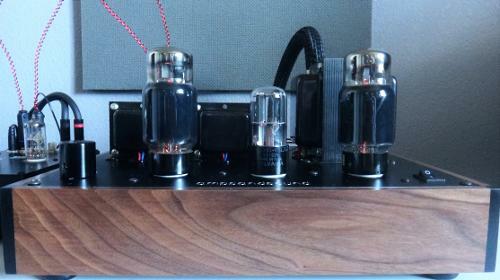 I've read these Gold Lion tubes take hundreds of hours to settle in - maybe the low end will improve over time. Definitely less mid-forward compared to the 6CA7-Z, but they projected a holographic stage. Paired with the Audioquest Nighthawks, the sound was dynamic and addicting. The Mogwai, Gold Lion KT66 and Nighthawks make good company. Next, I tried my Gold Lion KT77s. 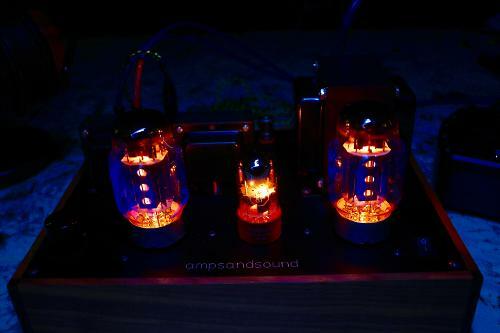 These are great tubes, and sounded fantastic in this setup. 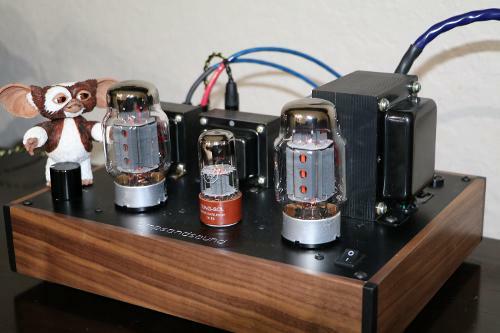 Currently, my favorite tube in this setup is the PSVane 6CA7-Z treasure tube. It delivers luxurious mid-range, extension on both ends of the spectrum, and all the nuance I want. It's a very engaging and commanding sound. A ton of drive and grunt - even though I was optimistic, I wasn't expecting such killer performance. On Allison Miller's latest release with her band, Boom Tic Boom, I'm hearing more of the room even with the luscious mid-range. Kirk Knuffke's cornet has plenty of both breath and body. The kick drum moves air like you'd expect and the upright bass has a ton of woody tone and blossom in the lower reaches. The second track on James Blake's record, Overgrown, has some deep reaching synth bass notes. The Mogwai with the 6CA7-Z delivered on this track with great extension, though limited power and grip. Of course, you're not gonna get full control over those drivers with this amp, but it delivers very satisfying bass. It is tuneful and with plenty of texture - that's also the 6CA7-Z's. The quality of bass in the more common bass guitar range - both acoustic and electric - is excellent. I've been told some prefer KT88 tubes for their linearity and exemplary low end performance. While, I don't have any on hand, I'll eventually give it a go. Overall, the Mogwai's circuit is transparent - all tube swaps were easily apparent - and, this is certainly one of it's strengths. It's also responsive to tube upgrades. You can roll (affordably!) to your heart's content. This was key for me. I'm currently limited to the Nighthawks for testing headphone performance. In this area, the Mogwai delivered quiet performance, musical and commanding sound, and with tons of headroom. I hope to have another pair of headphones to try out soon. This is a heck of a lot of amp for the money. If you want a stout, quiet tube headphone amp, and dig rolling, then the Mogwai is a great choice. Nice review, thanks. Just purchased a Flac download of a Boom Tic Boom album, sadly from 2010 so not the most recent work, but the only album of this band on Flacit.com. A sweet review, seems like a cool amp for people getting into world of tube rolling.